I bid you to enter our Circle tonight. The Dark of the Moon occurs on the 3 nights before the New Moon appears in the night sky. Each of the Dark Moon nights has a particular Shadow force associated with it. They are called the Lady of Shadow, the Lady of Blood and the Lady of Bone. The Shadow force retains ancient ancestral memories and wisdom that can be absorbed and used by the living witch. Everything that was once alive and has died and been buried in the Earth adds to the wisdom of the Shadow. Some places on Earth have a very strong Shadow force that may lend a "feeling" to the land. It may be where a battle has taken place or an ancient place of worship. When the sun goes down the Shadow rises from the ground, in the blackness of Dark Moon night anything is possible. At the Dark of the Moon, no light disturbs the rising Shadow force. The 3rd night before New Moon belongs to the Lady of Shadow who brings forth power from beneath the Earth. She brings memories of living beings who have died and been re-absorbed into the Earth Mother. This powerful energy can be most readily found in the dark of midnight, pooled around the stems of plants and herbs. My night is the first of the three Black Moons. Bestowed to me from the memories of everything that has lived and died. This magick I pass to the Lady of Blood. The 2nd night before New Moon belongs to the Lady of Blood, who receives the memories from the Lady of Shadow and brings them forth into the world of the living to be used by those who are trained in the Art of Witchcraft. 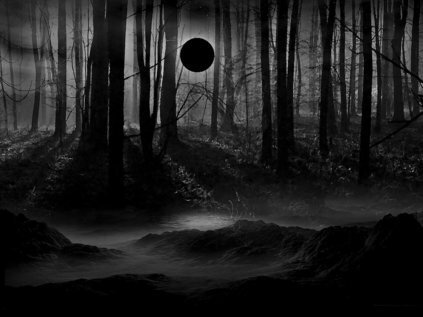 My night is the second of the three Black Moons. The last night before New Moon belongs to the Lady of the Bone, who keeps and preserves the memories and mixes them with new experiences from the living Witch. The Lady of Bone then sinks back into Mother Earth and passes the experiences mixed with memories back to the Lady of Shadows. This is the cycle of Shadow. Preserver of all that was, is, and shall be. Gatherer of the scattered bones. My night is the last of the three Black Moons. I preserve and remember all magick, old and new. These memories I pass to the Lady of Shadows.